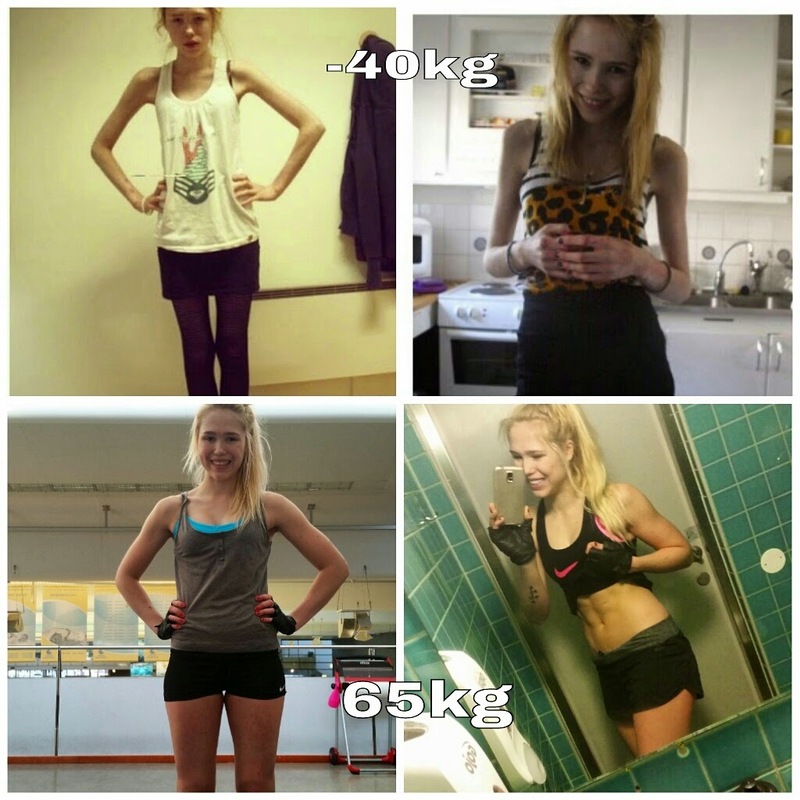 A Life without Anorexia: Do i ever have bad days or fall back into eating disordered behaviours? Do i ever have bad days or fall back into eating disordered behaviours? So, why can some people fully recover and others not? Its all about motivation and a persons own will to fight. No one can make you recover, they can make you gain weight. But recovery from an eating disorder is more than the physical aspect, its about the mental aspect. Its about yuor fears, your insecurities, your habits, your thoughts and everything else controlling you. If it was just about gaining weight then no one would be struggling for so many years. Of course, the physical is important because when you are undernourished and underweight you cant think clearly. Your brain is not functioning properly so everything becomes a bit more distorted and it is harder to fight. But when you are a normal weight and eat properly, then your brain gets more energy and you can actually fight your eating disorder better because YOU and the rational part inside your head becomes stronger. So yes, weight gain is also important even if the mental part is more important. They form new healthy habits and beginning living a normal life where food is no longer the main focus or anxiety doesnt control their life. Its a process, just like with self love... it took me 2 years to get to the stage i am today with truly loving my body. With recovery, you need to choose it everyday. Its not just a... May 4th i choose recovery and then you never make an effort to change things or to eat even if you think you have choosen recovery. But recovery is a choice you make everyday. But also, i know many are scared of having a BMI higher than 18 or 19, but the truth is... after an eating disorder you do need to weight more. This is because 1) your body has been so stressed that it needs to weigh more to function properly but also 2) it decreases the chance of relapse. For me, when i had a BMIof 18,5/19 when i was declared healthy, it only took a few months before i was depressed again and had lost weight and thoughts were coming back. (This was also due to stress, anxiety and lonliness in school which triggered me to feel so negative and then i lost my appetite). But now when i weigh more and have a BMI of 21 or 22 or something like that if i lose weight it doesnt really trigger anything for me... and not even if i eat less one or two days, that just makes me really hungry. So by weighing more, i am decreasing my chance of relapse but also with time my coping mechanisms become even better. I need advice... I went for a walk this morning, just 15 minutes and I am used to doing a lot of exercise each day and eating like 2500 calories. But I am sore and don't want to do anything else today. If I have a lazy day... Should I only want like 2000? 2000 calories really isn't that much food!! So eat 2500 and rest :) Your body will thank you!! I have faith you'll get there Emily! Just think, you are helping yourself and your family and friends won't have to see you struggle anymore or worry about your weight. That was my main motivation. I didn't want to die and I wanted my parents to not worry and I wanted to get my friends back and go out on dates. Izzy. If you don't mind me asking, what sparks your depression or serious stress/ anxiety? What coping methods work for you? How do you get out of a slump of really bad days? You are a naturally light-structured person, Izzy, I think we all agree on that. Even still, do you sometimes for instance lie on your bed and feel some of your bones pressing on yourself lightly and think: "Am I still too skinny?" This is no kind of attempt to shame you for anything that you are. I've just personally got some experience of this, as a recovered and normal weight person, that's why I'm asking. I did not believe it either, that one can fully recover, but now I do, because once the fear is replaced with love, the fear-thoughts disappear.